The benchmark 62% Fe import price including freight and insurance at the Chinese port of Tianjin jumped $1.00 or 1.7% to $60.10 a tonne on Wednesday according to data provided by The SteelIndex, following a 4% jump the day before. The Metal Bulletin’s 62%-index at the ports of Qingdao-Rizhao-Lianyungang made an even stronger recovery with the price soaring 2.2% to $60.89 a tonne. A rally that began on April 16 seemed to run out of steam last week, but today’s advance brings to 28.7% the commodity’s gains since hitting record lows at the beginning of April of $46.70 a tonne. A more than 20% appreciation from a low is considered a bull market. The price slumped 47% last year and remains down 15.6% in 2015, however. Recent strength came on the back of a period of restocking by Chinese steelmakers where the beleaguered industry enjoyed a rise in rebar prices and are ramping up production. China forges almost as much steel as the rest of the world combined (compared to just 25% in 2004) and consumes more than 70% of the world’s seaborne ore trade. Port stocks have fallen from its peak above 110 million mid-year 2014, but remain elevated at more than 90 million tonnes. At the same time the rebound in the country’s steel production is also coming from an unusually low base as production fell by 2.1% in the first quarter. Steel consumption in China fell last year for the first time since 1995 after years of overcapacity and low profitability and a pollution clampdown by Beijing could see as much as 40% of the country’s small and medium-sized operations being shut down. Concerns about oversupply also continue to dog the market. 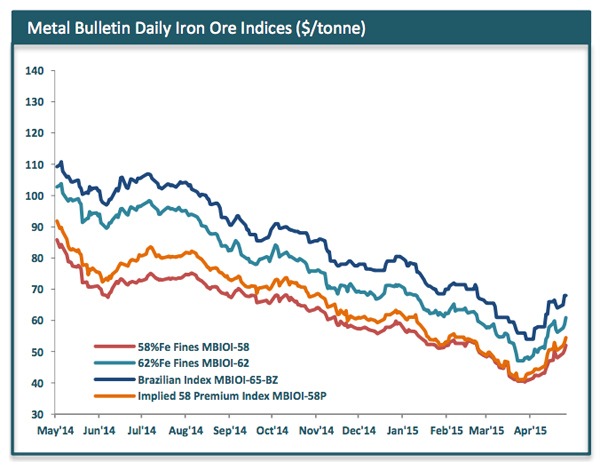 The Big Three iron ore miners – Vale (NYSE:VALE), Rio Tinto (NYSE:RIO) and BHP Billiton (NYSE:BHP) – announced production numbers last month showing output continues to climb. “Recent cuts help, but the market is expected to remain in an albeit-smaller surplus over the medium term,” UBS said.